The daily paper has a story about the ouster investigation that we posted here on Tuesday from Knox County Law Director’s Bud Armstrong‘s first public comments about that investigation on Monday night. Armstrong who retired from the TVA before passing the bar exam and becoming a lawyer appears to be using that federal government bureaucrat thinking. The daily paper reports that Armstrong says that settling the Evelyn Gill lawsuit was in Knox County’s interest because the family was seeking $500,000 and he settled for $93,000. Only a federal government bureaucrat can see that as a $907,000 savings, where as we the taxpayers see it as $93,000 expense and an admission of guilt on the accused. By the way, why was Gill never required to answer the suit? what legal counsel represented Gill? Gill was not in the employment of the school district in October 2018 when the lawsuit was filed. Her only active employment was as a County Commissioner when the suit was filed. 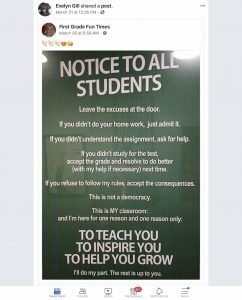 Interesting Facebook find on Gill is what she shared on March 31, 2019, which she has NOT been a teacher since October 31, 2017. Facebook page of Evelyn Gill. Shared on March 31, 2019. Previous story Is it Time for an Unbiased Observer to Make the Call on Evelyn Gill? The Question to the DOJ has been asked!